Gabumon X is an altered version of Gabumon that carries the X-Antibody Factor : Gabumon in its Digicore. Although it was originally classified as a Reptile-type, it became a Beast-type itself after absorbing the fur pelt data of the Beast-types it loves so much. Its timid, bashful personality has not changed, but once it wears its fur pelt, it changes to favour rough fighting styles and launching quick attacks typical of a Beast-type. It acquired the technique "Petit Fire Hook", a striking technique in which it envelops its right hand in its "Petit Fire" and uses it to pound the enemy. As a result, it does not wear its precious fur pelt over its right hand. Gabumon X was added to Korean Digimon Masters on August 29nd, 2018. 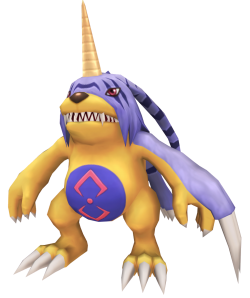 Gabumon X was added to Global Digimon Masters with the September 28, 2018 Patch. Ram into opponent with its horn. Petit Fire. Ice attribute 18 seconds cooldown 57 DS consumed 3 skill points per upgrade Learned at Lv. Shoots blue ray that instantly freeze anything in vicinity. This page was last modified on 21 April 2019, at 22:30.